As today is the real start to Spring, I flung open the French Doors, tidied up the front porch and set the table in blue and white. In hindsight, I should have ironed the table cloth, but other than that, I think the results are very pretty. 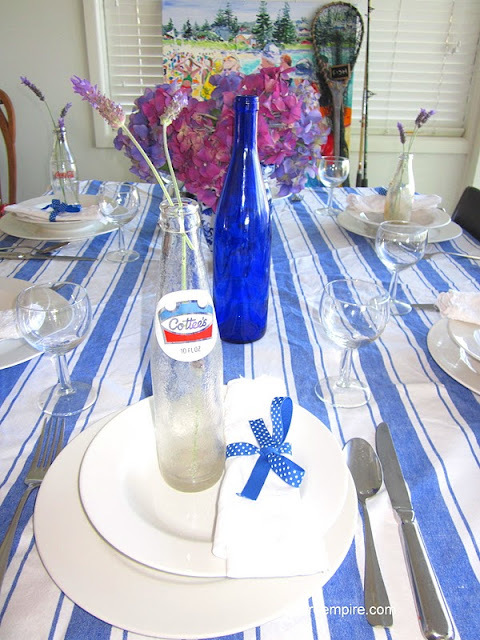 I am particularly loving the little vintage bottles at each place setting, with little sprigs of lavender. The ribbon napkin holders are a thrifty addition, which mean you can change the colour scheme easily and for next to nothing. 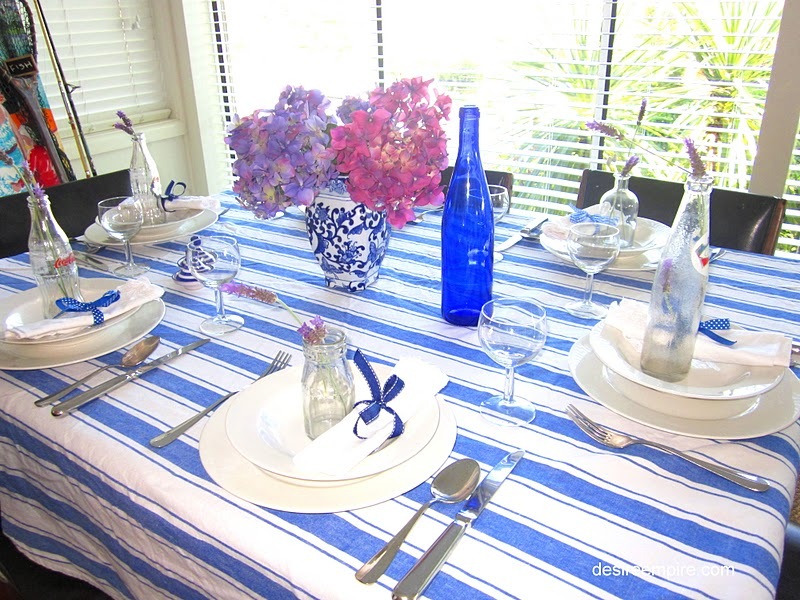 The pretty blue and white centre piece with silk hydrangeas, was a thrift find at our local fete. You remember the one where I entered the chocolate cake baking competition. Read about that here if you want to know how I went. I've been considering for some time now that I might paint the furniture on my porch white. It would definitely freshen and brighten the look out there, but I have no intention of painting the boards white, so I am wondering how it would go. Like all of us, I relish your comments so let me know what you think? White or leave it as is? I definately need some art work out there above the seat. Now there the possibilities are endless. Driftwood, coastal vintage poster.......any suggestions? White - paint white! Fresh, and would go so well with your style! Breath of spring for you, breath of fall here! What a pretty table. 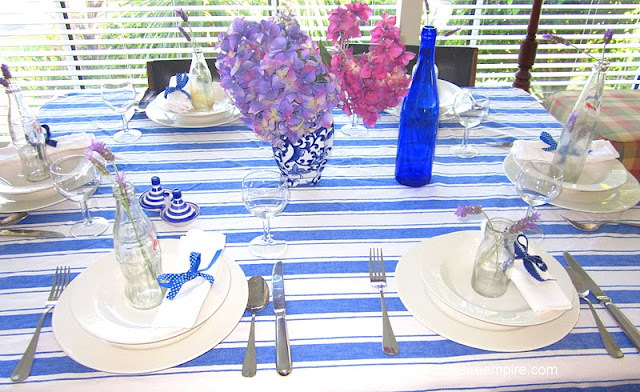 Blue and white is always lovely and that tablecloth is just breathtaking! I love the deep blues in everything and the blues in the flowers are perfect with it. Lovely! i love your front porch and what you did with it! and i always love blue and white. I love this tablescape! I would paint the porch furniture white. And I would put something over the seat. I love the idea of a vintage poster or driftwood. Both are reasonably priced options. Very pretty table. 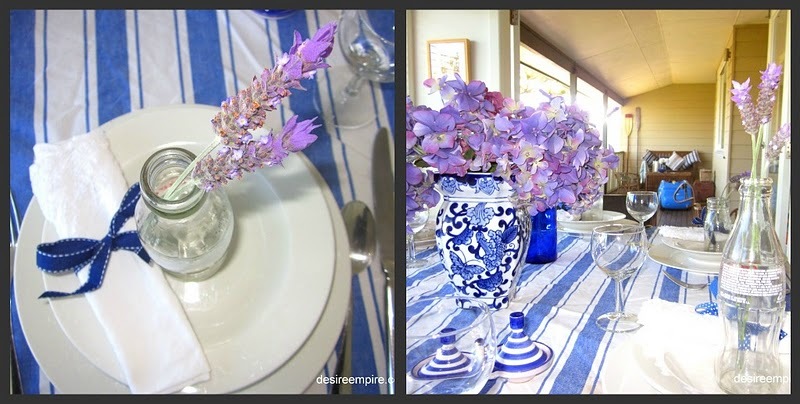 I love the touches of lavender with the blue! What a great porch to have! 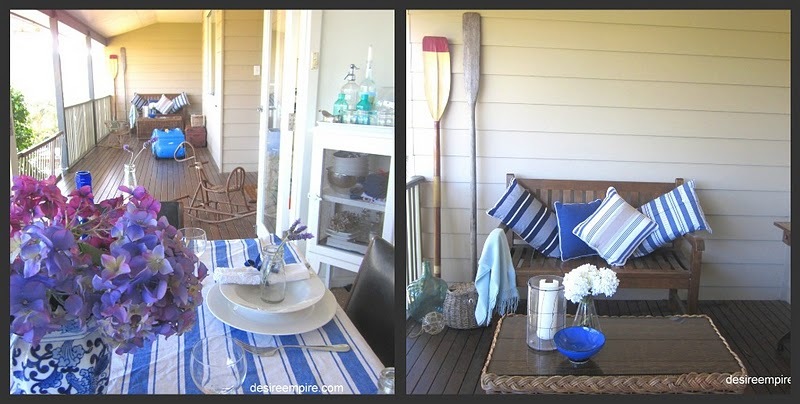 Lovely, simple and refreshing coastal table. Very casual yet very pretty. Loved the centerpiece, with the hydrangeas in that gorgeous vase, a perfect combo. I really enjoy blue and white together, so fresh! 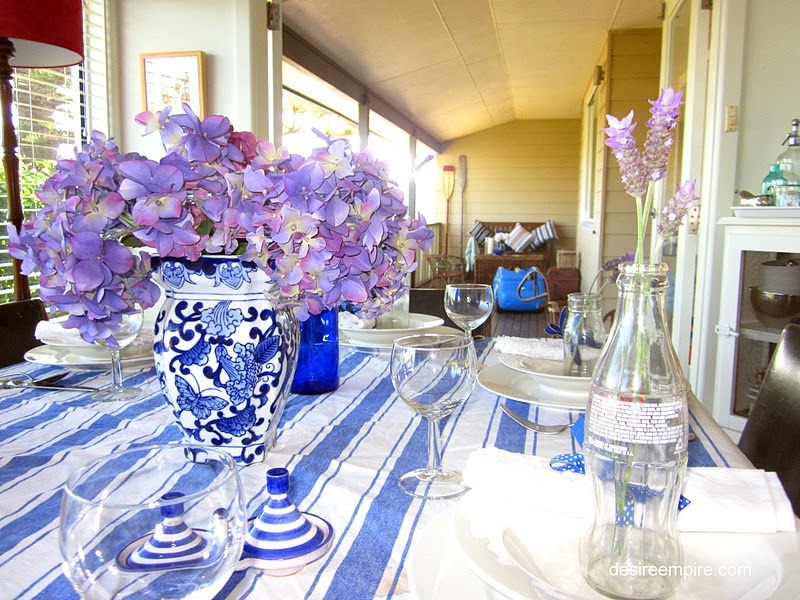 I love the blue and white but my absolute favorite is the hydrangeas! Blue and white table settings are my favourite and this is gorgeous. So springlike and lovely. My favorite color combo! It all looks gorgeous and so crisp and cheerful. Thanks so much for sharing it at Inspiration Friday this week! Your blue and white table looks so pretty and fresh! Perfect for Spring and so inviting! Yes, paint the furniture white. Everything looks so great, you have a perfect space there. 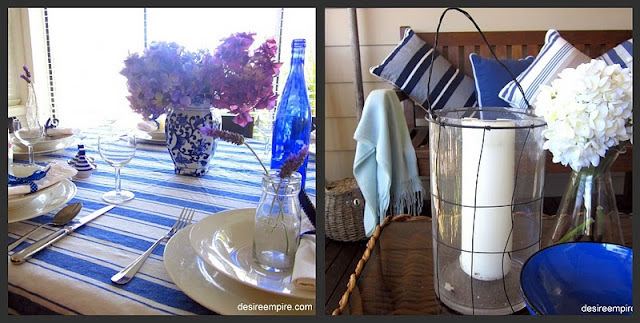 I love blue and white together especially during the spring and summer. It's so refreshing to see you celebrating Spring as today (Friday) is our first official day of Autumn! Enjoy the season, and have a great weekend! It's no metter if you didn't iron it, looks great, really. Love blu and reminds me of some boat decoration, or of sailors, or even of the sea :) Great work! 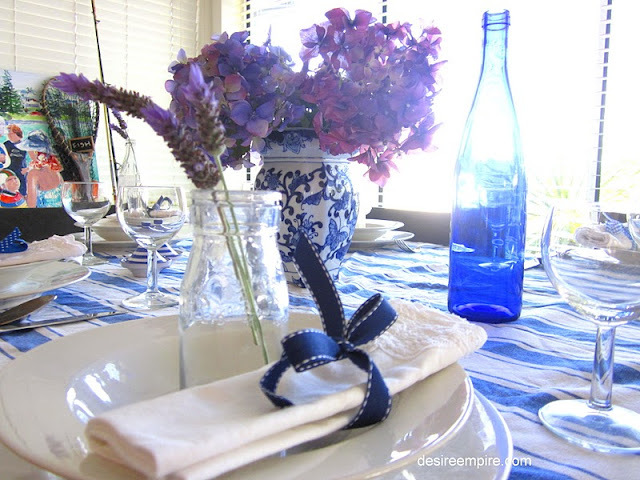 Georgeous table setting! I like the idea of white painted furniture...very Hamptons! What a beautiful table -- but of course, blue and white is my favorite!!!! Oh my gosh, it looks just beautiful! I love all the blue! Oh I can only dream of summer, but I can enjoy yours. I just love the blue and white and the bottlew with lavender adds a perfect touch. I would paint the furniture as it would brighten it up and flow so nicely with the rest.